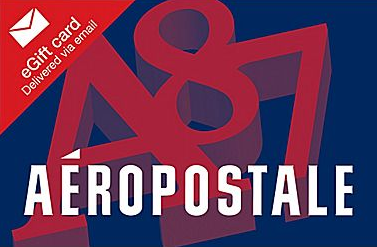 Aeropostale $50 eGiftCard Just $40! You are here: Home / Great Deals / Christmas Deals / Aeropostale $50 eGiftCard Just $40! Nice! Do you have an Aeropostale fan on your shopping list? Well, this might be the deal for you then! You can get a $50 Aeropostale eGift card (through email) for just $40! You can have it emailed to you to wrap and give or you can have it emailed straight to them! You can have it emailed to you and you can then email it to them on Christmas Day, if you like!